Can I just say how insanely happy I am as a Duck fan to see the men’s basketball team doing so well? The team is 16-2 and undefeated at home. They have upset some major players in the college basketball world and have garnered the attention of fans all over the country for their splashy wins. The Ducks’ only two losses of the season came late in the game and were heartbreakers, especially the game against UTEP, which the Ducks lost in triple overtime. Oregon is the only undefeated team left in PAC-12 conference play; and is, as expected, at the top of the standings. They are ranked #21 in the AP poll and are expected to rise after today’s polls are released. What else could the team and the fans possibly wish for this early on in the season? The answer to that is continued success. If the Ducks were to keep their ranking until the selection for the NCAA tournament begins, they would be seeded fourth. If the Ducks were to remains undefeated in conference, they would be the unofficial conference championships though the “real” conference champion is chosen in the PAC-12 tournament at the end of the season. 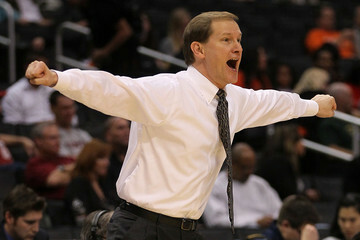 The head coach, Dana Altman has done a great job of recruiting and bringing out the best in every player on the roster. When the Ducks play as a united team, they are a nearly unstoppable and are a cohesive masterpiece to watch. The only times they have lost games or struggled greatly has been when the players were thinking “me first” instead of “team first”. In the games of late, the team seems to have finally reached the perfect meshing point, which points to further success for the Ducks. Oregon’s next game up is against unranked Washington State, which really should not be much of a challenge. The Cougars are 10-8 overall and only 1-4 in the PAC-12, ranking them #10 in the conference. As a fan, it is nice to be in a position to just sit back and watch to see what your team does next. We can only hope that at the end of the season, the game that we are sitting back and watching in the Championship game.